The following morning after a Georgian feast, plenty of wine and a good night’s rest, some of the group took a walk up to the ancient fortifications before we set off to our next start point. This is where we’d planned to follow a route along a ridge at 3000 meters before dropping into the next valley. We had woken that morning to heavy rain and low clouds, taking a look at the ridge which should have been visible from Omalo we could see it was completely covered in cloud and mist, it didn’t look promising. Nevertheless we set off in the hope that the cloud would lift and the rain might slow by the time we reached the start point. This was to be the most challenging day of the tour yet the most rewarding. 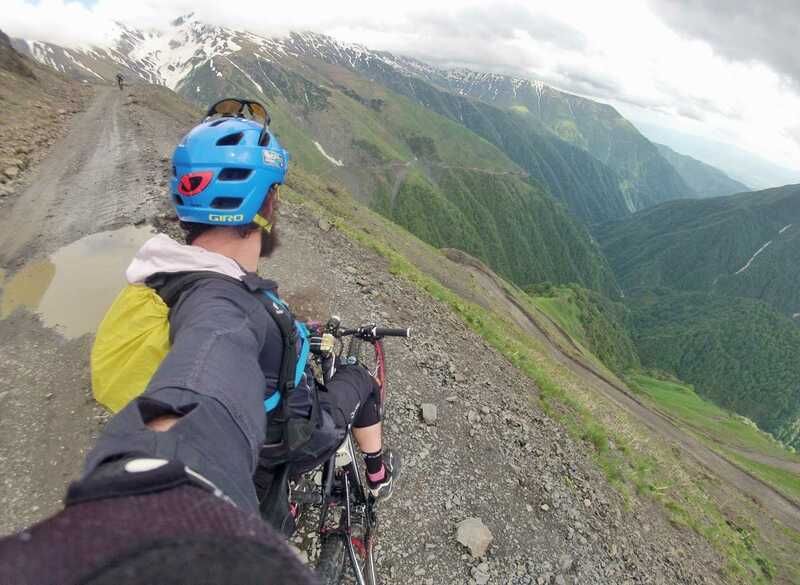 It’s featured in the first half of the short film “The trail to Kazbegi” which follows a team of professional mtb riders, adventurers and film makers as they attempt to cross the Atsunta pass by bike from Tusheti to Shatili, the mountains on that occasion got the better of them and they had to turn back. Would the same happen to us? Unfortunately it wasn’t to be, and as we approached the climb to the start point our second trial hit us. One of the bike racks carrying three of our bikes snapped! The drivers had been struggling with the conditions to climb some of the rain soaked, muddy ascents and in their attempt to climb one particularly slippery ascent one of the drivers had driven too fast over a pothole, the size of a bomb hole! And the excess downward force had snapped one of the links. Fortunately the bikes were fine, but the rain was coming down hard and we could clearly see… that we couldn’t clearly see, if we were to attempt the high ridge route. 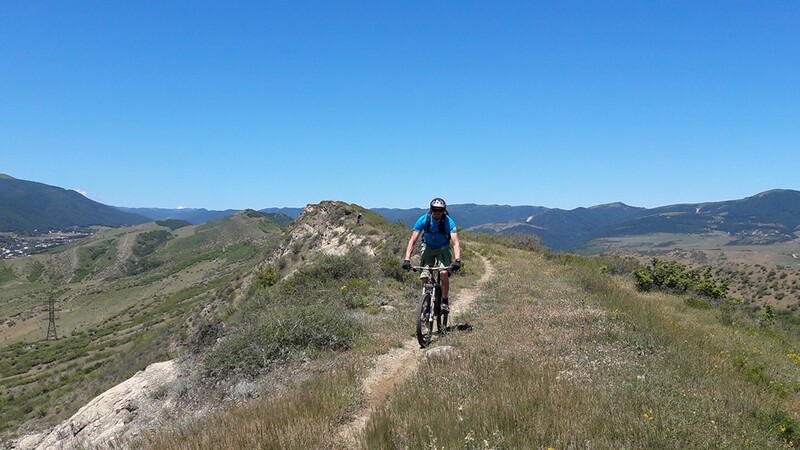 We decided it would be wise to abort the ridge ride as the dangers were obvious and to head for Dartlo, some of the guys whose bikes had been on the rack decided to ride along with one or two others. The rest decided to take a rest day and stay out of the torrential rain in the vehicles. 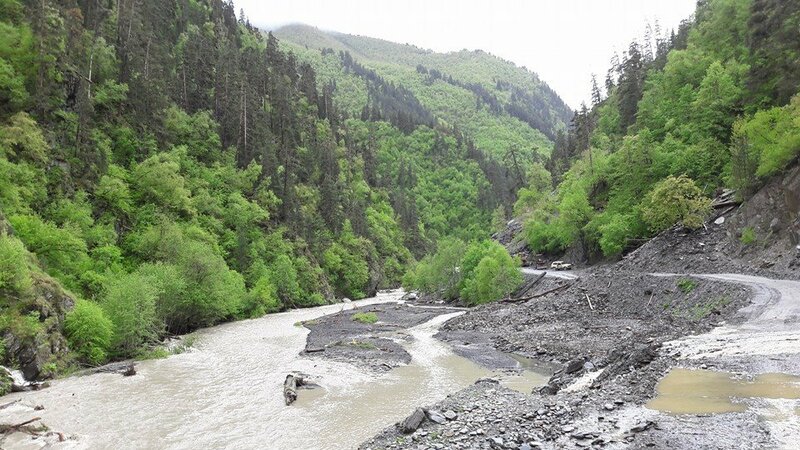 After a further climb of about 5kms we reached the pass and crossed into the pirikit alazani valley, for those in the vehicles it was an experience in itself as the roads are very difficult to negotiate even in 4x4’s especially in such adverse conditions. We arrived in Dartlo in the mid afternoon. For those who’d ridden it was a gem of a descent the rocky, hard pack, wet and snaking descent, winds through the forest down one side of the valley at a precipitous angle and throws up all kinds of obsticles along the way. It was clear when we arrived in Dartlo that regardless of the bad weather they’d had a great ride down. Dartlo is one of the most picturesque villages in Tusheti nestled on the side of the north Caucasus mountain range over which Chechnya can be reached, with a tributary of the Alazini river running to the side of the village, dropping down the side of the mountain through rock sided waterfalls, it’s dotted with defense towers. The village is inhabited throughout the summer months and there are several guesthouses and a café. We realized that the decision to abort the high ridge ride had been a wise one, as what we couldn’t see through the cloud cover was that the top of the ridge, now clear of cloud cover, was covered in freshly laid snow! It was time for a feast, chacha and wine. Our Guesthouse for the night in Dartlo is typical of the region, built into the side of the mountain. Parts of the kitchen wall are mountain rock. Our hosts for the night prepared us a delicious supra with plenty of dishes both local and national. And we settled in for a long night of fun and banter. 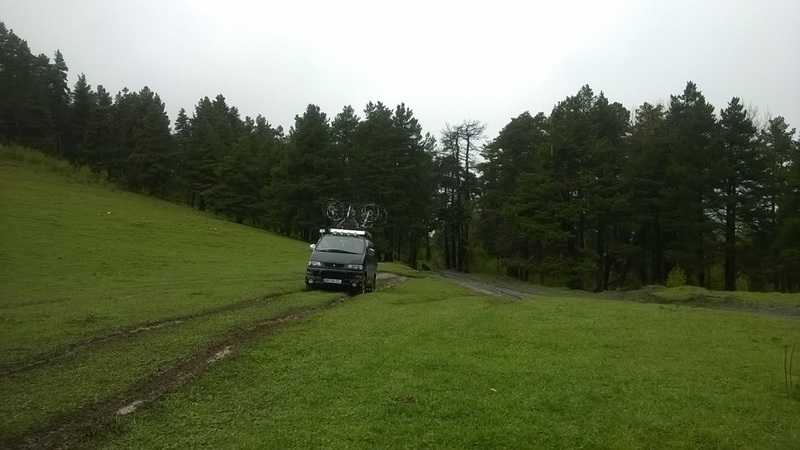 The following morning the rain hadn’t abated and we made the unfortunate but wise decision to head back to Tbilisi and seek better weather and with it some local single track via the epic descent from the Abano pass. 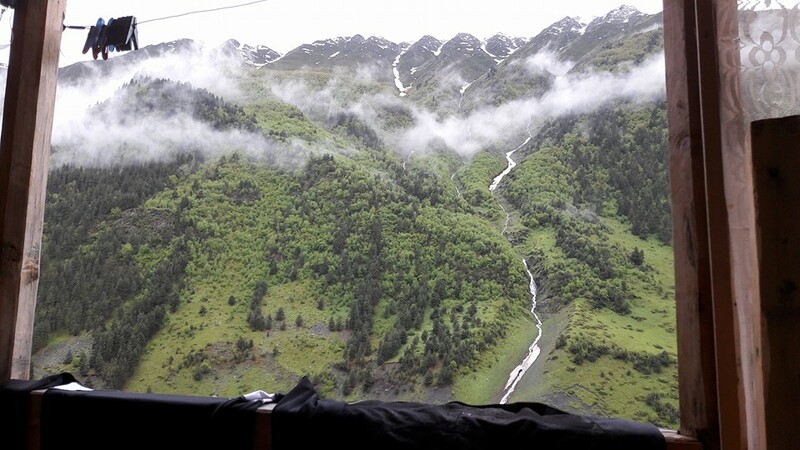 After a wet but thrilling ride down the pass avoiding parts of the road which had slid due to heavy rain we loaded the bikes and headed back to Tbilisi. Back in Tbilisi we were a little luckier with the weather and spent the next couple days enjoying the many trails in the mountains around the city. It’s unusual for the weather to be so bad at that time of year, it was after all June. However it’s easy to forget these are the Caucasus mountain range, the highest in Europe and as anyone who spends time in the mountains will know the weather can change for the worse in a matter of minutes in such places and it’s always wise to ere on the side of caution when riding or trekking in such places. Nevertheless, great rides were had, delicious food consumed and more than enough cha cha, wine and beer to put a smile on everyone’s face during our epic adventure in the Caucasus mountains.